Balestier 0 Courts Young Lions 0 | Tigers lack killer instinct | Switch Play! Balestier Khalsa had to settle for a point after they failed to find the back of the net against the Courts Young Lions (CYL). The Tigers were the slight favourites heading into the game, having held a couple of big guns – Etoile and Home United – to gritty draws in their last two games. They were aided in their efforts by Shakir Hamzah’s 36th-minute sending off, but wasted their chance to pile men forward and get the goal they needed. I was disappointed when I saw Balestier line-up in the same formation they did in the past two games – a 4-1-4-1 with Kim Young Kwang playing a ‘dual-role’ of midfielder and second striker. I felt they could have started with two upfront here, but Salim Moin probably thought he could overpower CYL’s centre-midfield by having Kim as an extra man there. There were no surprises in his lineup, with Anaz Hadee starting ahead of Prime League boy Fariss Haiqel – who looked shaky against Etoile – at right back. CYL, meanwhile, started in their 4-2-3-1 formation, a norm now. With Khairul Nizam still banned and Haniff Jaafar in poor form, the quick Fazli Ayob led the attacking line, with Shahfiq Ghani as a trequarista behind him. The duo frequently swopped roles, with Fazli more accustomed to an offensive midfield role in recent seasons. Safirul Sulaiman was picked ahead of Zulfahmi Arifin to partner Izzdin Shafiq in the centre of midfield, while Afiq Yunos played at left-back, with Shakir coming inside to partner Hariss Harun in centre defence. The first half (and entire game actually) was uneventful as far as goal-mouth incidents were concerned. In the opening 10 minutes or so, CYL showed good movement and pace to trouble the defence, with Fazli and Shahfiq taking turns dropping deep, and Nazrul looking lively on the right flank. However, this pace died down after a while, with Nazrul’s poor control letting Sathiaraj in to dispossess him numerous times, and with Paul Cunningham coming to grips with Fazli’s movement. Shakir’s sending off for a second bookable offence – fouling K Vikraman while the Balestier man was on the run – nine minutes before the break saw Robin Chitrakar make immediate changes. Robin plugged the gap in defence by bringing on Eddie Chang for Shahfiq, and also swapped Safirul for Zulfahmi because the former was too attacking minded for his revised set up. Eight minutes after the restart, Robin made his third substitution, sending on Faritz Hameed for the ineffective winger Faris Ramli. This change saw a significant shift in CYL’s shape. 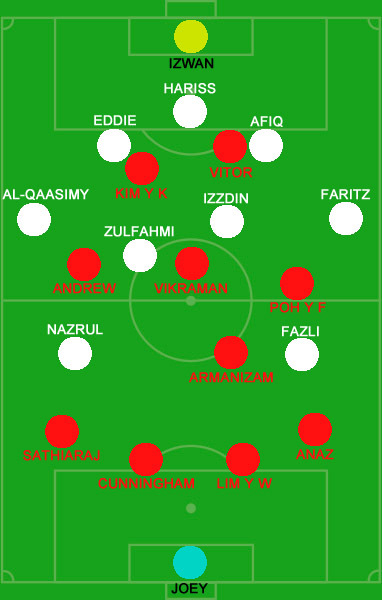 They moved into a 5-2-2 shape with Faritz and Al-Qaasimy as wingbacks, and Hariss as a sweeper between Eddie and Afiq. 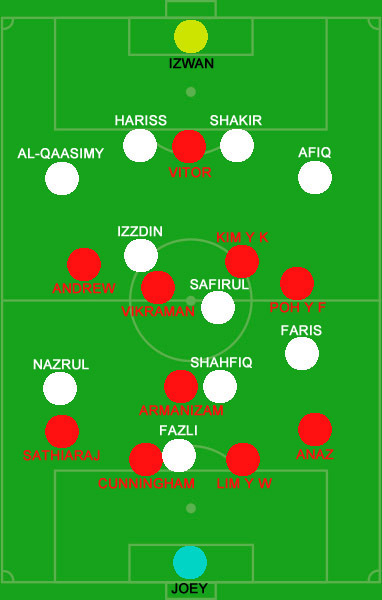 Nazrul took up a position on the right, and Fazli in a left-ish wing position, as the only outlets for their attack. Robin was practically telling Salim: “I’m going to sit here for the rest of the game, now it’s up to you to come at me.” The problem is, the Balestier coach was not ready to do that. After the red card, the only change Salim made was to push Kim up and play a front two (right). He continued with this 4-1-3-2 formation for the second 45 minutes. Even when he sent Cunningham upfront in the final 10 minutes, he removed Kim for Ishak Zainol, who effectively sat in Cunningham’s centre half role. This failure to take advantage of their numerical superiority was what cost Balestier two points. 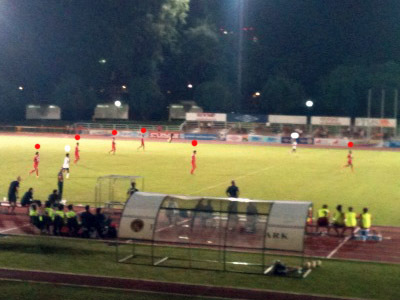 As an example, I managed to snap a picture (below) from the stands, of Balestier’s wastefulness. This was in the final 10 minutes. You can see Fazli and Nazrul on the right and left flanks being marshalled by not two, not three, not four, but SIX players. The back four in the picture was Anaz, Lim Y W, Ishak and Sathiaraj, with Armanizam just ahead of them and Vikraman – their main creative source – still in the picture. The fact that their best attacking player is among SIX players marshalling two wingers when they were looking for a win, says it all for me. Salim might not want to admit it, but his lack of adventure when presented with the advantage of an extra man, cost him the win. They could have sacrificed one defender – perhaps Anaz, who was on a yellow card – from the moment Faritz was sent on for the CYL, but he didn’t. As a result, his strikers faced a 3 v 2 situation everytime they had the ball, with Hariss mopping up well behind his two defensive partners. In the end, Balestier can have no one else to blame for picking up only that one point, because they had more than a half to figure out how to make use of that extra man. But they didn’t. @ Stylemestiada – Flattered by your comments, sir. Am a huge, huge fan of your own blog myself. Sorry for such a late reply, I haven’t been free enough to update this blog regularly! @ Frank – Sorry for the late reply, will e-mail you soon. Cheers.